This velvety tummy warming parsnip soup recipe is slightly sweet, rich and savory. It’s a wonderful mix of flavors and a meal in a bowl. I love soup based meals. For me a tasty soup just needs a piece of crusty bread and possibly a side salad to make it a great meal. One of the joys of this recipe is that it’s a quick and easy 30 minute meal. You can put a pot of this freshly made homemade vegetable soup on the dinner table fairly easily any night of the week. This curried parsnip soup is vegetarian, but you can make it a vegan soup with jusst a few adjustments. Replace the butter in the recipe with coconut oil or another vegan butter substitute. I omit the milk entirely anyway, even though I am not a vegan, but you can use a milk alternative like almond or soy milk in its place if you prefer. Melt the butter in a large pan. Add the parsnips and onions. Cover and cook over low heat for 3 to 4 minutes. Add the curry powder and turmeric. Stir to combine and cook for 1 minute. Pour in the vegetable stock. Bring the mixture to a boil then reduce the heat and simmer, covered, until the vegetables are tender. That will take about 20 - 30 minutes. Remove the soup from the heat. Allow it to cool for about 10 minutes. Blend using an electric blender, hand blender or food processor until the soup is smooth. Return the the pan to the heat. If you want, add about 1 cup of milk or enough to get the consistency you desire. Stir over low heat until the soup is heated through, making sure it doesn't boil again. Sprinkle with croutons as a garnish. 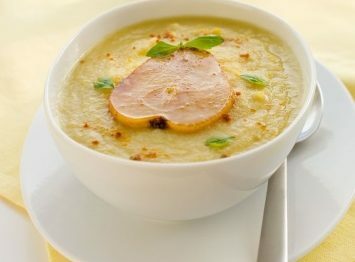 If you want the soup to look really beautiful, top each bowl with a thin slice of ripe pear and a touch of turmeric. It makes a fabulous presentation, especially if you are serving the soup as part of an entertaining dinner. I like the flavor of this soup without the milk so I simply leave it out. I find that when the soup is whizzed in the blender, or by using a hand blender, the consistency becomes smooth and creamy. That’s creamy enough for me and I just love the flavor as it is. But this is a spot where you can suit your own taste. If you like the milk certainly add it. It will be yummy. It is important to cook the spices in the butter for a few minutes before you pour in the vegetable stock. Cooking the spices first really releases their flavors and creates a richer tasting soup. That’s a tip that you can use in the kitchen all the time, especially for things like curry. Cook the spices a bit first and you will end up with a richer. tastier sauce or soup. If you really want to lower the fat content of this soup, cut the amount of butter you use to 2 tablespoons instead of 1/4 cup. The butter does add beautiful flavor to this soup, so I wouldn’t leave it out. You can treat yourself to just a bit of beautiful butter in the interest of deliciousness can’t you? 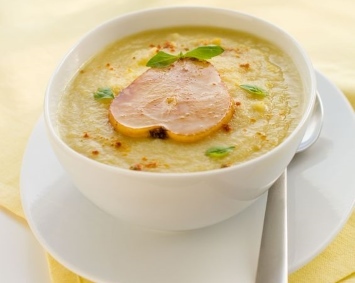 If you love this parsnip soup you’ll want to have a look at all of our soup recipes. Look here. If you like this recipe, I’d love it if you would Pin it to Pinterest, Tweet about it, and Like it on Facebook. Or leave a comment and your own favorite recipe below.